The debate over health care reform’s constitutionality will reach its climax on Thursday morning, when the Supreme Court issues its ruling. But the fight over health care will go on, however the justices rule. It’s a fight that progressives should welcome, but one, I suspect, they won’t win if they keep fighting like they have been. Ever since oral arguments, when the conservative justices expressed extreme skepticism of the government’s position, supporters of the Affordable Care Act (including me) have been bracing themselves for the worst. But Monday’s ruling to knock down the Arizona immigration law is a reminder that you can’t always predict outcomes based on oral arguments. The conservatives gave the government a rough time in that case, too. On Thursday, a majority of justices could issue a ruling upholding the law and reaffirming existing doctrine about federal power to regulate the economy. Or a plurality, composed of the Court’s four liberals, could vote that way, while one or two conservatives, presumably Chief Justice John Roberts and/or Justice Anthony Kennedy, could issue a separate ruling upholding the law only because congressional taxing power allows it. Walter Dellinger, the esteemed constitutional law expert, sketched out just such a possibility last Friday in Slate. 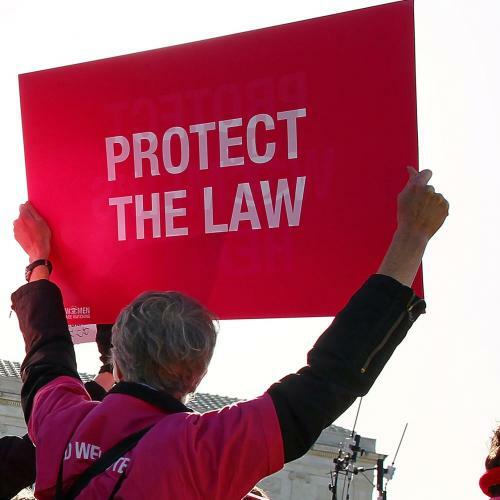 But a ruling upholding the Affordable Care Act would not end the controversy over it. Remember, Obamacare faces two mortal threats. One is from the judiciary. The other is from the White House and Congress, should the voters in November hand both over to Republicans. And even the November elections won't end the debate. Conservative activists and their Republican allies are waging a war of legislative and administrative attrition against implementation—and, at the state level, they’re having some success. The Affordable Care Act calls on states to manage the new insurance system, most obviously by having states set up exchanges through which people buying insurance can get subsidized, comprehensive coverage. Many states are holding off, waiting to hear what the justices and then the voters say, while others have made clear they will not participate no matter what happens in the next few months. The federal government has authority to step in and manage these efforts when states refuse to participate, but that’s a lot easier said than done. And that’s the best-case scenario. The justices on Thursday could just as plausibly invalidate part of the law, while leaving the rest in place. They could, for example, throw out the mandate. They could also throw out the mandate along with regulations prohibiting insurance companies from denying coverage or charging higher rates to people with pre-existing medical conditions. Conservatives would undoubtedly consider such a verdict a victory. And they would be right to do so, because they would have successfully weakened health care reform and established new limits on federal power—all because of an argument that virtually the entire legal establishment once dismissed as insane and still finds highly unpersuasive. But conservatives and their Republican allies wouldn’t stop there. They’ve already indicated that, once the Court rules, they will press on with their efforts to repeal whatever is left of it. Liberals would almost surely respond to such a verdict with their usual mixture of angst, despair, and self-flagellation. (Just think back to how Democrats reacted to Scott Brown’s victory in the January 2010 election to fill Ted Kennedy’s Senate seat.) But that would be precisely the wrong thing to do. As I’ve noted repeatedly, a ruling that invalidated the mandate only would not be catastrophic: Fewer people would end up with insurance and the program, as a whole, would be less efficient. But the core elements of the system would remain in place, people with pre-existing medical conditions would finally have access to comprehensive coverage, the deficit would actually end up slightly lower, and people making less than four times the poverty line (about $90,000 a year for a family of four) would pay the same as they would if the mandate were still in place. A ruling that invalidated the mandate and the insurance reforms would be significantly worse. But, even then, key parts of the law would remain. Chief among them would be the expansion of Medicaid to all people making less than 133 percent of the poverty line, which would effectively establish universal health insurance for the poor. The point is that these provisions are worth defending—and, quite honestly, they are easier to defend than the individual mandate. Polls show that provisions guaranteeing insurance to people with pre-existing conditions command strong support in the public. As Greg Sargent discovered recently, they even command strong support among Republicans. Anger at the court will, and should, be even bigger if the Court does the unthinkable and throws out the entire law. In that case, the Court will have vastly overreached—not simply by disregarding precedent on flimsy arguments, but also by throwing out much more legislation than was necessary to make its constitutional point. It’s a cliché to say that an activist court is legislation from the bench. But if five conservatives justices invalidate the most ambitious, significant piece of domestic legislation in a generation—and do so even though, as the law’s opponents admit, a simple change in political rhetoric would have made it constitutional—legislating from the bench is exactly what the Court will have been doing. But simply criticizing the Court or defending the law’s remaining provisions or making the case for full implementation isn’t going to win the battle over health care reform. Liberals must reclaim the moral high ground. And that shouldn’t be hard to do right now. Conservatives have made very clear what they think about health care. They think it’s fine if many tens of millions of Americans can’t pay their medical bills and, as a result, have to go without care and/or endure financial catastrophe. They’ve proven that not just by advocating repeal of the Affordable Care Act but also by endorsing Paul Ryan’s approach to the federal budget, which would end the guarantees of coverage that both Medicare and Medicaid now provide. Whichever way the court rules on Thursday, liberals should point out that conservatives have no plan that would come remotely close to replacing what they wish to take away. And then liberals should ask some tough questions. They should ask conservatives why a small business owner should have to go bankrupt just because he got into a car accident or developed cancer. Or why a restaurant employee with diabetes should have to risk blindness because she can’t pay for regular care. Or why the mother of a disabled child should have to give up her home because an insurance company decided physical therapy fell into a coverage gap. Or why a retired office manager should end up in poverty because the value of his Paul Ryan Medicare voucher long ago stopped being enough to pay for good insurance. And, at least in Washington, liberals shouldn’t be afraid to ask conservative critics of health reform a more impolitic question: Do you have insurance? How good is it? And why shouldn’t the rest of America have the same kind of security? If the Court upholds the entire law, as I hope it does and remain convinced it might, liberals be relieved. But the proper response to any verdict ought to be renewed determination. Making sure every American can get basic, affordable medical care has been a progressive cause for roughly a century. That won’t change after Thursday, no matter what the justices say.